Maybe you’re familiar with this experience: the alarm buzzer rings, you stretch and sit up, plant your feet on the floor, and—ouch! As soon as you put weight on them, you feel a stabbing pain in your heels. It recedes after a few minutes of moving about, but comes right back again the next morning. 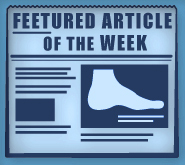 You’re experiencing a condition known as plantar fasciitis. Your heel and toes are connected via the plantar fascia, a thick band of tissue that runs across the bottom of your sole. It’s designed to support your arch and absorb shocks, but injury or overuse can rip microscopic tears in the tissue, leading to swelling and pain and causing the band to tighten and shorten. That’s why it hurts so much in the morning—once you’ve had a few minutes to walk around, the plantar fascia stretches back out a bit and stops pulling so hard on your heel. Plantar fasciitis is the most common (although by no means the only) cause of heel pain in adults. It’s an overuse injury caused by repeatedly placing more force and tension on the area than it can withstand over a period of time. Although anyone can suffer from this condition, it’s especially common among middle-aged people, particularly those who do extending standing or walking as part of their jobs or enjoy activities that cause lots of heel stress – running, dancing, basketball, etc. Bad foot mechanics, structural foot deformities, an abnormal walking gait, and obesity also can magnify your risk by forcing your feet to absorb more weight, or by distributing it poorly. The good news is, in the vast majority of cases, a few lifestyle changes and conservative treatment measures can greatly reduce your discomfort. We will still need to determine the precise cause of your plantar fasciitis symptoms, though, to develop the most effective treatment method for your situation. In most cases, a regular regimen of stretching and physical therapy can relieve pain by strengthening and stabilizing your muscles and joints. We can instruct you on the best stretches to perform, or teach you how to tape your foot for extra support. Splints that keep your plantar fascia and calf muscles stretched while you sleep may also be recommended, though it can be tricky to learn to sleep with them at first. If pain is stubborn, anti-inflammatory medications or steroid injections can help with the swelling. If a structural deformity or gait abnormality is putting extra pressure on your arch or heel, we can fit you with custom orthotics to redistribute your weight more evenly. These devices are molded to your exact specifications, providing the maximum possible corrective benefit (more so than over-the-counter inserts). You can do a lot at home to manage your symptoms and prevent future outbreaks, too. Maintaining a healthy body weight, choosing shoes that properly cushion and support your feet and replacing them when they wear out, as well as performing simple stretches, can do a world of good. When pain flares up, use ice or massage to sooth aching tissues. If you’re a runner or engage in other high-impact exercise, try mixing low-impact activity (cycling, swimming, or weight training, for example) into your routine to give your aching heel and joints a bit of a break.